Lane Smith is one of those creators that my family completely takes for granted. We are huge fans of his work as an author and illustrator across a whole slew of titles like The True Story of the Three Little Pigs, The Stinky Cheese Man and Other Fairly Stupid Tales, Seen Art?, Madam President, Cowboy and Octopus, Princess Hyacinth, It’s a Book… the list goes on and on. My daughter swears up and down that Smith’s The Big Elephant in the Room and The Happy Hocky Family – two books that he both wrote and illustrated – are two of the funniest books she’s ever read. And we very purposely don’t own either title, because, when we take them out from the library, she sees it as an enormous treat. All that being said, with the regard that we have for Smith’s body of work, it’s really spectacular to know that he can still surprise us as a creator. 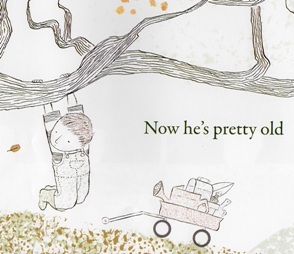 Specifically, I’m talking about his latest picture book, Grandpa Green, a book that I think, stands as a big shift in tone for the author, but it’s a shift that pays off beautifully. First, don’t get me wrong. 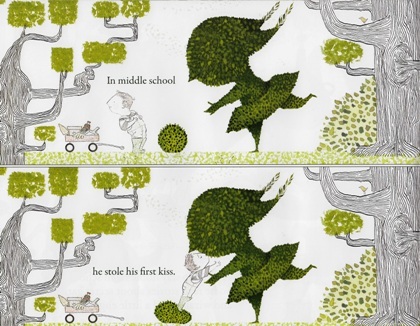 It’s NO surprise that Smith, as an illustrator, has delivered another gorgeous picture book. He’s proven himself as one of the most playful and innovative artistic talents in kids lit for years, so the fact that you want to frame every page of Grandpa Green and hang them around your house isn’t an earth-shattering revelation. I will say that Grandpa Green probably most closely resembles Smith’s Princess Hyacinth, but it adds this wonderful muted palette of greens and grays to an organic storytelling world that Smith creates out of an intricate and beautiful topiary garden. The ways that Smith is able to express emotion, memory, and the passage of time through the composition of this living, breathing garden is really something to behold. For me, the big surprise of Grandpa Green is the emotional punch that Smith delivers as an author. Smith has always been funny and painfully clever – see It’s a Book as a prime example – but Grandpa Green has a much, much deeper emotional core than any of his previous books. The premise is heartfelt and elegant – a young boy recounts the life of his great-grandfather as he wanders through a topiary garden that collects some of his great-grandfather’s treasured memories. We see a shrub sculpted to remind us of “Grandpa Green” as a baby, another sculpted as a tribute to his first kiss, another representing his service in World War II, and another series of meticulously-designed garden creations curated into a loving tribute to his wife. We follow Grandpa Green’s great-grandson as he lovingly walks through the garden, touring through his grandpa’s memories and collecting his misplaced gardening tools. Grandpa Green doesn’t ignore aging, but it doesn’t make it scary either. In many ways, Grandpa Green reminds me a lot of Pixar’s Up. Both works are about relationships between generations and how the elderly and the young interact and deal with memory. Grandpa Green isn’t as gut-punchingly sad as that first 10 minute montage from Up – you get the impression that Grandpa Green doesn’t have many regrets (good for him) – but I do love how both works portray the elderly as living, dynamic people. In my experience, most of the children’s books that I’ve encountered that deal with the relationship between children and the elderly all veer into Nana Upstairs and Nana Downstairs territory – namely, the relationship is all about the child coming to terms with the fact that the old person is either going to die or has just died. (Spoiler Alert – There is no death in Grandpa Green, but it does address the passing of time and effects of aging on memory.) Grandpa Green, on the other hand, creates this really wonderful garden landscape where the great-grandson takes on several roles – he’s the narrator, he’s a gardener in training, he’s an assistant, friend, and admirer of his grandpa – and revels in his grandfather’s accomplishments. This is a fantastic book, particularly if your child has elderly grandparents or friends who play a big role in their life. Because not every kids’ book about old people has to be about how they’re going to die any day now. 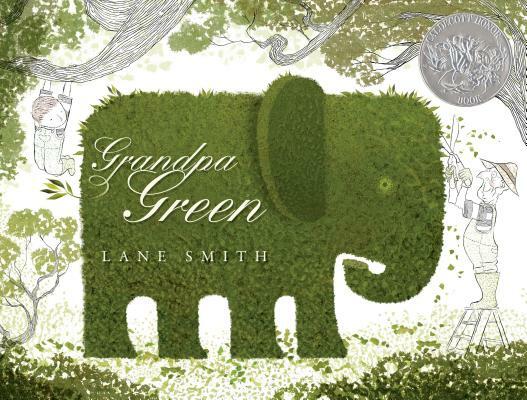 On the contrary, in Grandpa Green, Lane Smith has created a book that really celebrates aging, memory, and the relationship between the old and young in an extremely positive, emotional, and achingly beautiful way. AGE RANGE: Five and up, but it made a great bedtime book for a four-year-old in our family. 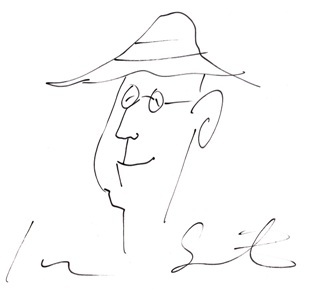 AUTHOR WEB SITE: Here’s the link to Smith’s website, which has some great art, videos, and archived blog projects showcasing more art and the fantastic “Curious Pages” blog, which highlights recommended inappropriate books for kids. I do wish there was more information on his individual titles, but, eh, I’ll take what I can get. BUY IT, BORROW IT, OR FORGET IT? : It’s definitely good enough to buy and would make a great gift book for any friend with elderly family members in their life or, heck, even just any parent or kid who was really into gardening. They will DROOL over the garden of Grandpa Green.